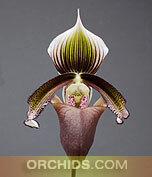 A combination of two awarded clones of this Paph. species to create a great new improved generation ! 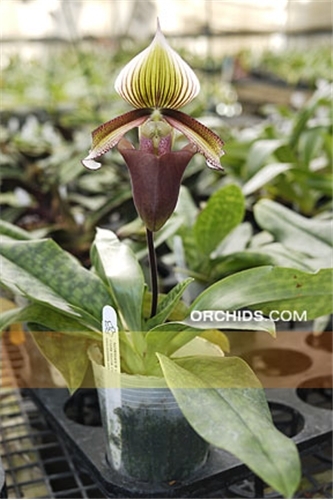 Producing flowers that can reach up to 11.0 cm in size, its white dorsal sepal is crisply accented with wine to brown striping radiating almost to the margins. The petals and pouch will reflect the same wine-brown, the petals further margined with wine-brown hairs. A new and improved generation of this beloved species and Highly Recommended !